“This is MY distance!” I thought as I charged up the hill. 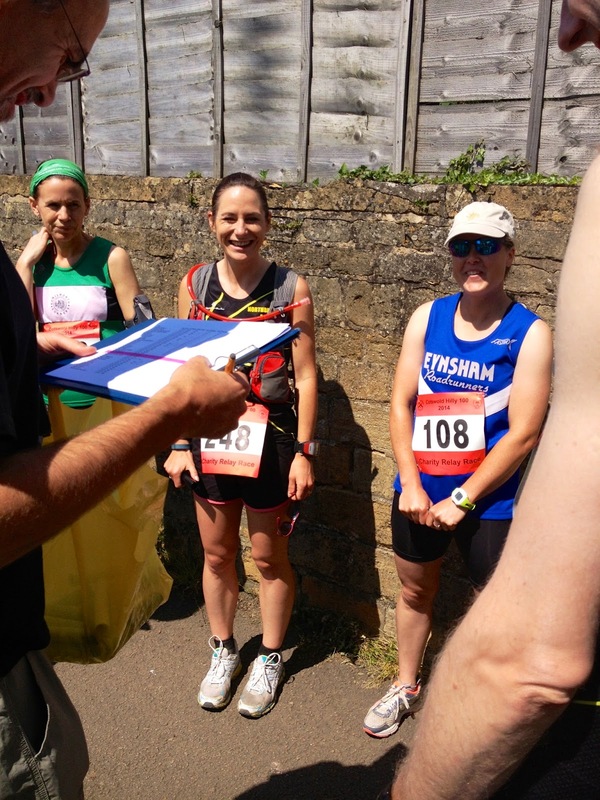 I was running leg 8 of the Hilly Hundred team relay and I had 10 miles to run from Moreton-in-Marsh to a village called Paxford - where my teammate was waiting for me to hand the baton over – and I was LOVING it. 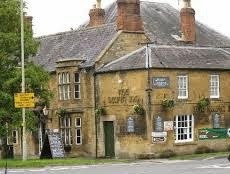 The sun was shining, I had hills to run and my starting point had been the pub! Plus I was also pretty sure there would be a pub at the end too. Most good English villages had a decent pub, right? 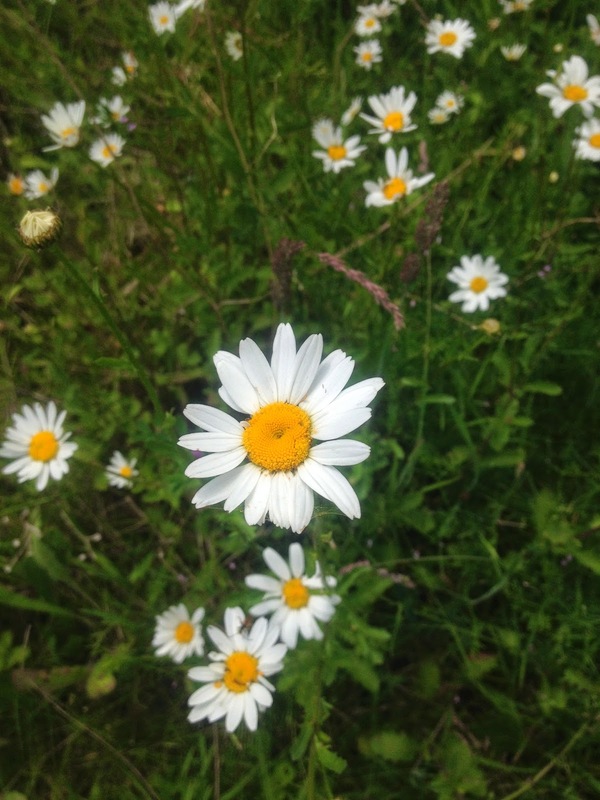 I knew the area a little bit – it was all very English, neat hedges and banks full of Cow Parsley and dandelions, fields lying like patchwork squares over the rolling hills and dusty lanes winding through them, all under a sky as blue as forget-me-nots. And I was running through the middle of it all enthusiastically with my grey relay baton clasped firmly in my sweaty hand. The route was a hilly one – I’d seen the total elevation map on a t-shirt for the entire 100 miles and it looked like a heart rate monitor reading. But I wasn’t fazed, I LIKED running hills. I enjoyed it all - the hard push up the hill, the views at the top and the exhilaration of running down the other side and seeing the good numbers on the Garmin. There was satisfaction in that. I had Googled the elevation of my relay leg and was pleasantly surprised. I’d been expecting a few more hills, but it looked as though there was about a 2 mile climb which started at 1.5 miles and was at its height at 5 miles, then it was all downhill to the end. Like a pyramid but with running instead of sand and camels. Sounded pretty good to me and it meant as soon as I got to the top of the first hill I could push on knowing there wouldn’t be any nasty hills hiding further along the route. My tummy had been roiling in the car on the way there. I get so nervous before races and even more so when I think there’s a team depending on me to try and run my best. I don’t know why I get so anxious – if things go wrong, they go wrong. I wouldn’t put pressure on anyone else, but can’t seem to help doing it to myself. I arrived at the start which was ‘The Swan’. It had a beer garden and a comfortable bench. Things were looking up already. There were a few runners from other clubs waiting for the mass start at 1pm so we all got chatting about the usual ... what races have you done recently (are you faster than me? ), what club are you in (are you competition?) and who are you here with (if you’re faster than me and I push you in the hedge will anyone see?). There was an air of competitiveness, but it was friendly and there was a nice sense of camaraderie. It seemed as though a lot of people did their 10 mile relay legs and then followed their team members in cars or on bikes or in their cars offering support and water. It was an unmarshaled course so there were no water stations or marshals giving directions. Apparently there were small arrows on some of the signposts but a few had been tampered with so it was a case of use your map and get yourself to the end. Or try to keep someone in front in sight and hope like hell they knew where THEY were going. I was going for the latter tactic. As it was so hot, I was running with my ultra vest and 1.5 litres of water. I’d brought some gels and planned to try and approach this race like I would a half marathon. I’d never raced 10 miles before so it would be a PB even if I came dragging in at the back of the pack having lost all the other runners and my map. And probably my sanity and love of hills. I finished my coffee and regretfully gave up my sunny spot to start pinning my number, checking my shoelaces and studying the map. Vinny and Tony from my running club arrived and it was nice to see 2 other Northbrook Sunburst vests. I was pretty sure they knew the way and thanks to Tony’s height I was relying on being able to see him over the top of the hedges to give me a clue as to which direction I should be going. Looking overenthusiastic. And gurning for some reason. Apparently we were running to the highest point in Warwickshire. Oh. But apparently it was worth it because of the amazing views across the yellow rapeseed flowers. Oh good. Couldn’t I go and look at some flowers on a flat bit instead? The man from the Godiva Harriers set off at a blistering pace, through the centre of Moreton-in Marsh, pedestrians and market stalls flashing past. I attempted to keep up but when I checked my Garmin and saw I was running at about my 400m pace, I decided that this was possibly my worst idea since my I-know-let’s-all-see-how-many-99p-burgers-we-can-eat plan. That ended in vomiting and wanting to crawl into a hedge and die too. I let him go (like I had any other option) but bellowed after him; “I hope you know where you’re going as we’re all following YOU!” and gave him a big grin. No pressure there then Mr Speedy Legs! We turned off the main street of Moreton-in-Marsh and into a peaceful country lane. I slowed my pace down a bit – I had to remember I had 10 miles to run today. It was a pleasant temperature under the trees with the sun dappling the stones of the lane. After slowing, I was expecting a flood of runners to come past but the only set of footsteps behind me belonged to Northbrook Tony who comfortably overtook me, chasing the Godiva runner who I could just see in the distance. No-one else was around now, just the two figures in front and me and the pat-pat-pat of my footsteps in the quiet lane. Up the hill, a gentle slope, but we then cut right as per the map and onto a short downhill. Huh. I hadn’t expected this but assumed it was too small to show on the elevation profile, left turn again into a small lane which stretched upwards. Ah ok ... so this must be The Hill. After which it would all be downhill to a glorious finish. And hopefully a cold pint. It was peaceful and still, the hot sun on my shoulders – almost as though I was running alone although thanks to the height of my Northbrook team mate I could occasionally see his head bob along above the top of a distant hedge. It was glorious running along in the sunshine, the dusty road under my feet – eyes set to the horizon and the relay baton clutched in my hand. I couldn’t help smiling. This was a brilliant race, winding lanes, hills and a nice long distance you can get your teeth into. Yep. 10 miles is definitely my distance, I told myself. Although, I couldn’t help noticing that despite having climbed a monster hill, the hedges were high and there was no sign of the amazing view promised. Or even any yellow rapeseed flowers. Consoling myself with the thought that maybe the person who had mentioned these drove a Land Rover or double-decker bus or something that could see over the hedges to the views, I had a brief moment of self-doubt. What if my downloaded elevation map was wrong? That there might be another hill? Nah. I dismissed the thought. I’d done my homework, downhill to the finish and the pint. Over the top and into a blissful downhill. Lovely! This is more like it. But I can’t help noticing that I’m running down into a valley shaped a bit like a bowl. How exactly do I get out of this valley without going up a hill? My downloaded elevation map PROMISED me no more hills! Bloody map. Bloody Google. I got to the bottom of the dip and followed the hedges round and yet again the lane stretched upwards. I huffed a sigh and urged my legs onwards passing a horse and rider and a cyclist. Eventually. We were all going uphill, my speed wasn’t up to much and I didn’t want a race photo with a hoofprint on the forehead. This was the hill that just kept on giving. Every time I rounded a corner, there was more UP in front of me. Stupid up. Where’s the down? I used my tried-and-tested tactic to get myself up the hill. My legs were going on strike and my head was telling me to walk. I picked a landmark and ran to that. Told my head and legs that I just needed to run to the landmark. Just to the next shadow, just to next telegraph pole, just to that piece of cow parsley. And kept picking landmarks. And then I was at the top. And looking at the next hill. Bloody hills. My pre-hills-of-doom race plan had been to just get up the hills steadily and then make up time by relaxing and running faster on the down hills but I hadn’t counted on my legs being replaced by what felt like wooden pirate peg legs. They were still moving but they were refusing to move any faster. In fact they wanted to stop. Nope. No stopping. Faster run, faster pint. Cars were leapfrogging me, overtaking me in the lanes then stopping in a gateway or at a junction and pouring out water ready to give to their runner. They were supporting their own teams but all acknowledged me and encouraged me and several asked if I wanted water. It was great that despite it being different clubs competing we all wanted everyone to do well. However, it was also a reminder that if I DID stop or took a walk break, there was someone just behind me who would overtake me. The cars were annoying as the lanes were so narrow, but the drivers were courteous and passed me as safely as they could. It also kept me running. And guessing. 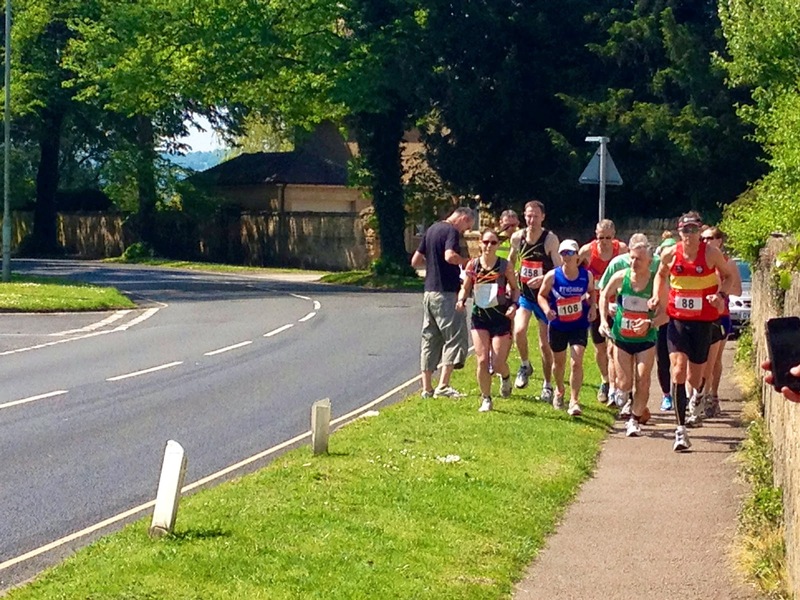 “That car overtook me much quicker than last time – their runner must be gaining on me.” Push, legs, push! No-one had overtaken me since Northbrook Tony in the first mile and every time I slowed to climb a hill or didn’t push hard enough down a hill, I expected someone to come tearing past me. Running down a hill at about mile 4, I heard footsteps behind me but I didn’t dare look behind. I couldn’t go any faster and sustain the effort on these hills. My gradient map was obviously wrong and I have no idea what’s coming up. If someone is catching up I don't want to see. I just couldn’t push it any more. I was hurting. How can it only be mile 5? It wasn’t just the hills that were causing me problems now. The heat was intensifying. I was trying to run in the shade from the trees, but the problem with starting at 1pm was that there weren’t a lot of shadows I could run in. I was glad I was wearing my trusty Poundland sunglasses. Cheap AND cheerful plus if I sat on them and squished them (the usual demise of my sunglasses) then I could get some more for the price of a car park ticket. Also they made everything LOOK cooler, although this was confusing my body and eyes and they were arguing about who was getting the correct info. I let them carry on. So long as my eyes and body were bickering, they weren’t telling my legs to stop running hills. And there was always another bloody hill. My plan of keeping a steady effort up the hill and hoofing it down the other side was being replaced by plan B which was ‘everything is too much effort but don’t stop’. I was plodding and boiling hot, I didn’t seem to be able to get enough water out of the water bladder and I was feeling like hell. I was trying not to get to plan C which was ‘collapse in road and hope someone will find you and carry you to the finish line’. I remembered an article I’d read on Runners World about ‘Head Vs Body’ and how a lot of running suffering is actually our head telling us we can’t do it and briefly I had a spurt of energy. Very brief. Which dried up at the start of the next hill. Nope. It’s definitely my body telling me to slow the hell down. Can I stop or will team be disqualified? Please let me stop! What if I fall over? Or lose the baton? All of this was going through my head, but I was still running. I wanted to stop, but wouldn’t slow down to walk as then I’d be overtaken by the runners I was sure were behind me. How’s that for fuzzy logic? Although I did notice that while I was having this internal dialogue I was actually running better as the voices were distracting me. So ... if a car hits me I can stop? It felt like an endless Groundhog Day of uphills and downhills. Just more and more miles of lanes and hedges and hot, hot sun and more hills. More bloody hills. I passed a race supporter’s car, who had been leapfrogging me, for the umpteenth time. “Nearly there!” he shouted. I was suspicious. What is ‘nearly there’ to a supporter? Another mile? Another 2? I’m pretty sure I’ve shouted “Nearly there” to a marathoner at mile 15. Maybe this is karma. I came round the corner and onto a main road. Just keep pushing, keep running. I passed a turning on the right. Was I meant to turn there? I was lost, there was no-one to follow. Just keep running. The Bad Runner voices started in again; “You’ve gone the wrong way!”, “You’ll have to backtrack a mile!”, “You’ll never make another mile – look at you. You’re done in!” My legs kept going. A car slowed near me – it was my family. “Well done!” Shouted 4yo from the back. “I think I’ve gone wrong.” I shouted to The Mr. “I feel like I’m running through treacle and hell and I might be running in the wrong direction.“ I kept running and the car screeched off and reappeared a few minutes later. “You’re nearly there! There’s a turning on the left!” The car disappeared again. Left? Their left? My left? Which is left? My brain wasn’t working any more. I was so close, I just had to keep going. Just keep going. Legs don’t fail me now. A turning! That’s a turning! Is that left? I have NO idea. Veering across the road. Is that Liz from Northbrook? Can I stop? No. I’m told to keep going. Left foot, right foot, left foot ... please let me stop ... runner coming the other way ... won’t take the baton. “I’m not on your team” and they run on. Someone please take the baton, I can’t stop until then, why won’t they take it? Left foot, right foot, a club vest I recognise, the baton is taken. Left foot ... and down. 4 year old has eaten my recovery banana. Ants are eating my arse. Yep. 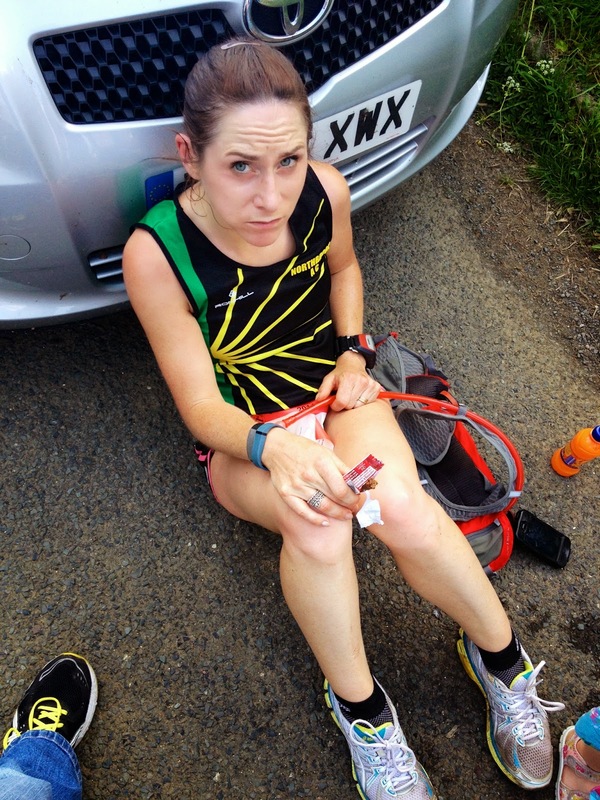 I finished my relay leg, crashed out on the bank for some recovery time during which 4yo finds my banana and eats it. Ants then discover I am sitting on their house (Hill? Nest?) and are exacting revenge by snacking on my arse. Apparently I did some amazing dancing. 10 miles is NOT my distance. At least not if there are massive hills. Don’t try and chase people quicker than you. Don’t give your relay baton away to an opposing team. You’ll be standing there looking confused when you could be sitting down. 4 year olds snaffle your recovery food given half a chance. Don’t trust downloaded elevation maps. I was running in the hottest place in the country on the hottest day of the year. The actual elevation profile. Damn you Google!! I was 10th overall for my relay leg (3rd on 1pm start) and 1st lady.